The Ghanian is already set for European football having signed for FC Porto. If there is a player who has the ability to spearhead a team and drive them towards a result, then Eric Ayiah is the name to look out for. A born leader and true fighter, Ayiah is a true performer and a just-to-be-complete player. 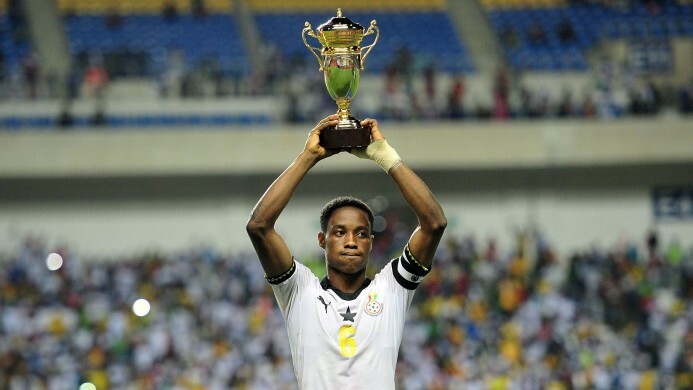 Eric Ayiah, right now, if not the best but surely one of the best young talents from Africa. Capable of playing as a #10, on the wings and as well as a lone striker, he has performed exceptionally well for Ghana. Kudos to them that they could not move forward in the World Cup. While being an out-and-out striker he was also played as a second striker who would fall down to create and assist the midfield. Resembling the style of Wayne Rooney, he has created several chances for his team. In this particular tournament, he has assisted one and has scored 3 in the quarterfinal run for Ghana. Physicality and Leadership. His captaincy skills were on display against USA in one of the group stage match, despite having lost the match, Ghana under him were more attack bound than their rivals. In other matches, his physical play, especially against Niger was key to how his team played. Tactically, Ayiah seems to be lost quite a few times. In the game against Colombia, Ayiah was caught out of his position on numerous moments yet he assisted the only goal of that game. AIFF has two sons. Who’ll get the love, and who’ll get the wrath? The appropriate use of his physicality in creating chances or scoring goals. The efficacy of off the ball movement in creating chances. If Ayiah is ought to shine in near future, He needs to perform well for FC Porto and consistently feature in Ghana’s Under-19 to Under-23 sides. Though African players do not get the deserved attention but Ayiah surely is a player who would make it big in Europe. Considering that he can be played alone or with a subsequent striker, Leicester City, AS Monaco and Borussia Dortmund are the clubs that would enhance his quality. Leicester City would be a like-to-like affair owing to his ability to handle the physicality while the club from Monaco would hamper his needs of a less tactical play over the individual performances. Lately, Kylian Mbappe has shined from the club structure and it would be interesting to how the club would use a player of Ayiah’s calibre. Dortmund’s academy is known to be the best. The likes of Emre Mor, Dembele and Aleksandre Isak initially signed for BVB in spite having offers from other European giants. With Mor and Dembele leaving the club and Aubameyang’s desires taking a toll over his desire to play for this team, BVB might love to consider swooping this guy to partner Isak in future. Another Under-17 player who took the tournament by storm is already present in the youth program.